It’s hard for agents to meet with clients, show listings and make the vital connections that are key to becoming more successful when they have to spend too much time handling administrative tasks and other essential duties. That’s why, according to the National Association of Realtors, 18 percent of agents currently use an assistant. Many agents believe that once they are achieving more than 20 transactions per year, it’s time to hire an assistant. Doing so can ease some of those burdens and make agents more efficient and more accessible to their clients. A well-trained and capable assistant can maintain an agent’s schedule, manage marketing duties and organize all the paperwork necessary for each transaction. These individuals can become invaluable members of a real estate team and help the business grow to new levels. So how do agents find the right assistant for their business? Holly Pickens of the Pickens and Placko Team with Baird & Warner emphasizes knowing what kind of help you want from an assistant before hiring someone. Bryan Bomba of Coldwell Banker hired his first assistant in 1998 during his first year as a real estate broker. He realized he needed help once he was doing more than two transactions a month. Jennifer Mills Klatt, whose Home Discovery Team is associated with Jameson Sotheby’s International Realty, began working with assistants 15 years ago. At the Pickens and Placko Team with Baird & Warner, both Pickens and Margaret Placko have decades of experience in the industry. Once they started working together as a team, they hired their first assistant on a part-time basis. 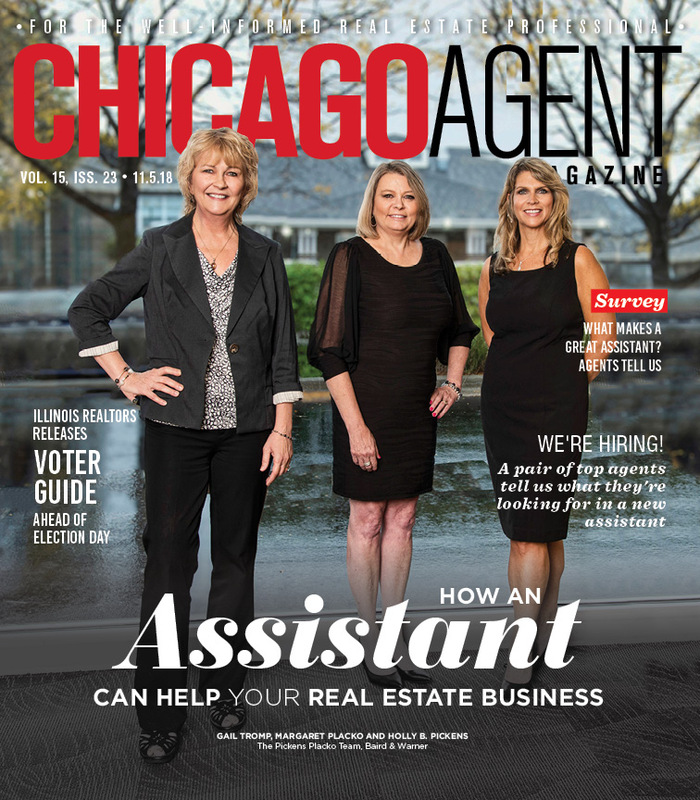 A pair of top Chicagoland agents now hiring for an assistant. What are they looking for? Taking on an assistant represents a major fundamental shift in how agents conduct their business. But with time, the assistant can provide enough value to justify expanding the team and adding more assistants or more agents. Bomba started out by hiring a part-time assistant he found through an ad on Monster.com. That individual had experience working as a counselor for a relocation services company. As his business grew, he added more help. Pickens and Placko work with two assistants on their team. One is an unlicensed administrative assistant, while the other is a licensed agent they worked with in the past. Both serve valuable roles for their business. The licensed assistant handles tasks like appraisals, home inspections and closings that require a license, freeing up the brokers to spend time with their clients. Mills Klatt has one assistant – her nephew, Luke Jorwic – and the individual members of her team each has an assistant. Jorwic had expressed an interest in working with her as a teenager and joined while he was still a student at Loyola University. “First and foremost, you want someone who takes initiative; someone who mirrors you and follows and understands the level of detail you require; someone who is selfless when it comes to their time management,” Mills Klatt says. Hiring someone for the important work of helping manage a real estate office involves teaching them your unique systems and helping them get a feel for the connections that are invaluable to an agent. Bomba uses a training strategy with lessons drawn from his vast experience in the industry, as well as tutorials for the software tools he uses in the office. His group has a joint venture agreement with Apple that includes maintenance and repair service for devices and training on how to most effectively use them. Bomba also turns to online instructional materials for helping his assistants get the most out of the Google Office tools his team uses. Mills Klatt says Jorwic was able to quickly grasp many aspects of the business. He also had some administrative experience prior to the role, making the training process a matter of letting him absorb all he could about the industry. Pickens and Placko and the other two agents who are members of their team, Chloe Gatziolis and Michael Placko, also sit down with their new hires to explain the systems they use in the office and train the assistant on how to handle them. They use the same process when introducing a new system so everyone can get up and running quickly. They also have access to the training provided by Baird & Warner.